AnyMP4 DVD Converter can convert DVD/video to general video formats such as MP4, MKV, AVI, WMV, MOV, M4V and more, and 1080p HD videos like TS, HD MP4, HD AVI, HD MOV, HD ASF, HD H.264/MPEG-4 AVC and others. Meanwhile, it enables you to convert DVD/video to MP3, FLAC, WAV, WMA, AAC, ALAC, AC3 and more. 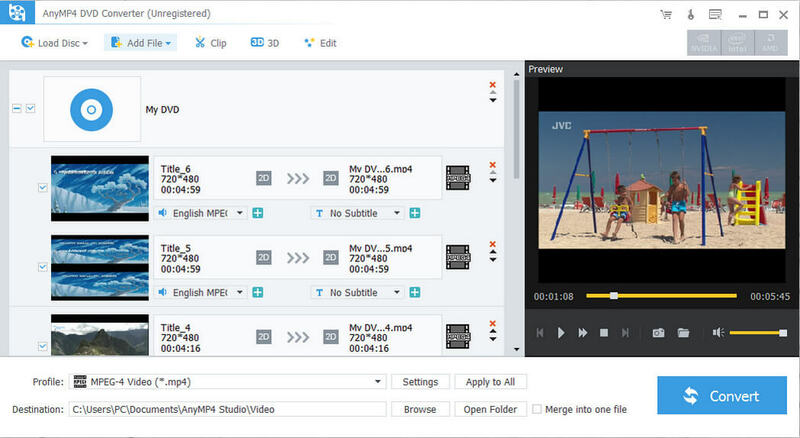 Moreover, you are able to trim video length, crop the video frame, add watermark to the video to modify video effect. So you are able to play the converted videos on iPhone XS/XS Max/XR/x/8, iPad Air 2, iPad mini 4, iPod, Samsung Galaxy S7 and so on. This DVD to Video Converter is able to help you convert DVD/video to MP4, MKV, AVI, WMV, MOV, M4V, TS, MTS and more with super quality. So you can enjoy your conversion on iPhone XS/XS Max/XR/X/8, iPad Air 2, iPad mini 4, iPod, Samsung Galaxy S7 and so on. This DVD Converter can help you optimize your videos freely. For instance, you can cut off any part of the video into segments, merge these segments into one, crop the video frame to your needed, adjust the video effect by setting the brightness, saturation, contrast, hue and volume, add text or picture watermark to the video screen and adjust video settings according to your needs. Statement: First, please download the orginal installation package by clicking the download link. Of course you may also download it from the publisher's website. Using AnyMP4 DVD Converter crack, key, patch, serial number, registration code, keygen is illegal. The download file hosted at publisher website. We do not provide any download link points to Rapidshare, Hotfile, Depositfiles, Mediafire, Filefactory, etc. or obtained from file sharing programs such as Limewire, Kazaa, Imesh, Ares, BearShare, BitTorrent, WinMX etc. Software piracy is theft. If you like AnyMP4 DVD Converter please buy it.